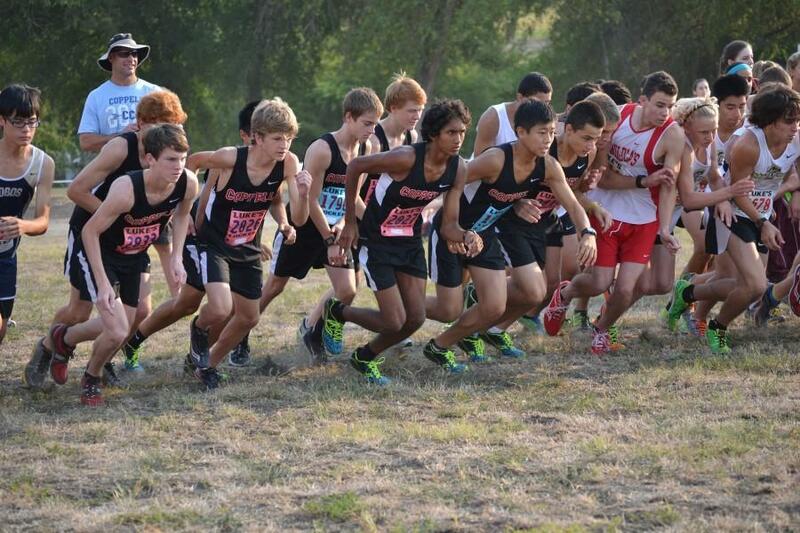 The Varsity boys team charges from the starting line at the Prosper Invitational. Photo by Elizabeth Sims. Wake up to get to school for 6 a.m. practice. Run six to eight miles. Get up even earlier for a meet on Saturday. Run three more miles as fast as you can against 20 other teams. Repeat for 10 weeks out of the school year. This is the life of the runners for the Coppell Cowboys Cross Country team, and that is just for the season. As their practices officially began on Aug. 5, the team started preparing for this exciting season well before school came back into session. With new captains seniors Stephanie Bilka, Alyssa Moino, Dabney Burch, Cassidy Packer, George Fairchild, Carson Vickroy and Chandler Moake and juniors Jessie Cranmer, Braden Young and Noah Freedman motivating them and coaches Roxanne Farris, Don Kemp, Chip Lowery and Clint Schnell pushing them back into condition, this group of 110 runners showed they still had the chops to compete after losing key leaders like Katie Sandfort, Shane Murray, Brantley Young and Alyssa Shelton at the end of last year. To kick off the season, a Run-A-Thon was held to raise money for the team. Runners would get friends and family to sponsor them and donate money for each lap they made around the Andy Brown West track. After running anywhere from eight to 11 miles, a breakfast and parent meeting was held at J. Macklin’s Grill. 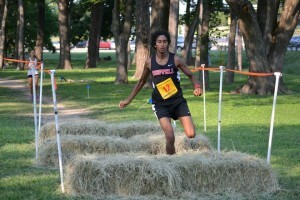 Junior Josh Thomas hurdles over a hay bale at the 29th annual Greenhill School and Luke’s Locker Six Mile Relay. Photo by Elizabeth Sims. freshman Alan Huo, finished sixth overall. The JV I boys team of freshman Nathan Sims, sophomore Jay Harrison, junior Shane Rigdon and senior Matt McCurry finished fourth in their division. The JV I girls team of freshman Taylor Dubey, seniors Stephanie Bilka and Dabney Burch and junior Laura Taylor also showed their talent and placed seventh in their division. Each relay group placed within the top 65 out of 100 teams present. Next came the Marcus I Invitational, where the runners faced rivals such as Flower Mound, Marcus and Southlake Carroll. The Varsity boys and girls each placed 11th overall. The JV boys took an eighth place finish, mere fractions of a second behind Flower Mound. The JV girls ran hard to earn a third place finish, beating Flower Mound and finishing seconds behind Marcus and Southlake Carroll. 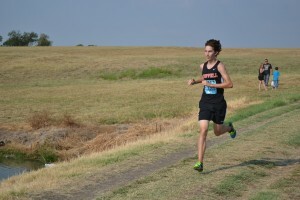 Senior Justin Armenta leads the JV boys at the Prosper Invitational, earning the team a first place finish overall. Photo by Elizabeth Sims. a second place finish overall. The JV boys also had a great performance with senior Justin Armenta leading the race by 15 seconds throughout the course, ultimately winning the team a first place spot. boys, once again, pulled off a first place finish overall with junior Anand Pant leading the charge. This meet was capped with a well-deserved week off to rest and prepare for the rest of the season. After their break, Coppell returned to compete in The Colony Cougar Classic. With a narrower course, cooler temperatures and rain on the horizon, each team still managed to place in the top six. The JV girls led the team with a second place finish overall. With the times from the Cougar Classic deciding the top seven Varsity runners who would compete in the Nike South Invitational in The Woodlands, Texas, some underclassmen on the team had the opportunity to step up and lead at the Jesuit Invitational in Dallas. Though the top seven faced tough competition at Nike South and found themselves near the back of the pack in the overall standings, the Varsity boys, Varsity girls and JV boys at Jesuit pulled to the middle of the pack, and the JV girls soared with a fourth place finish. In an effort to redeem themselves from the previous meet, Coppell pulled together to move up in the rankings at the Flying Hawks Invitational in Birdville, Texas. Despite the larger crowd, the Varsity boys, JV boys and JV girls all placed fifth overall. Missing a couple of their usual runners, the Varsity girls still landed in 10th place out of 25 teams. After their pre-district workout on Oct. 19, Coppell is ready to take on the district meet at North Lakes Park in Denton, Texas. With this being a familiar course for the runners, they are excited to compete and hopefully advance to regionals.